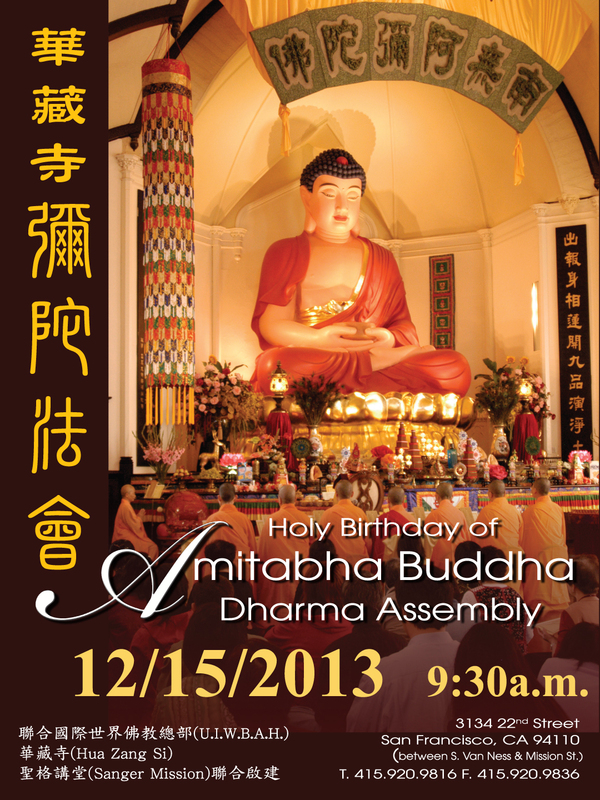 To celebrate the holy birthday of Amitabha Buddha, the United International World Buddhism Association Headquarters (U.I.W.B.A.H. 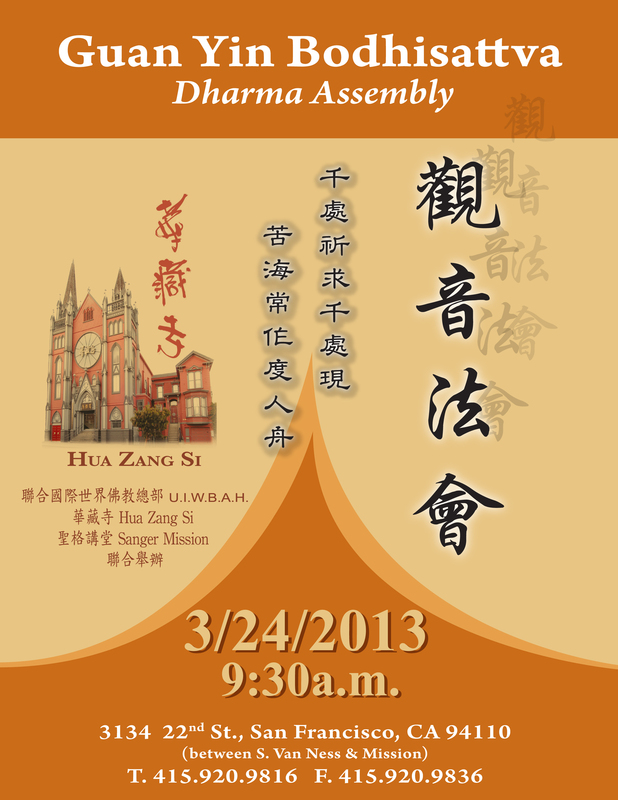 ), Hua Zang Si and Sanger Mission will jointly hold The Amitabha Buddha Dharma Assembly at Hua Zang Si in San Francisco on Sunday, December 15, 2013 at 9:30a.m. 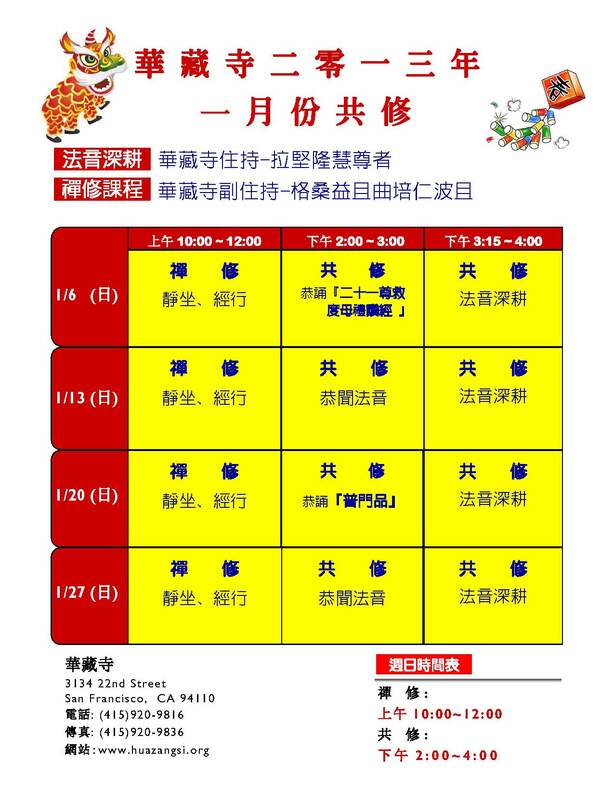 Date 日期: 12/15/2013 (星期日) 9:30A.M. Skanda Bodhisattva, the great Holy Dharma Protector protects and blesses all sentient beings in the universe with great compassion. He looks over the entire universe through his concentration and insight as he traverses between the earth and heaven day and night. 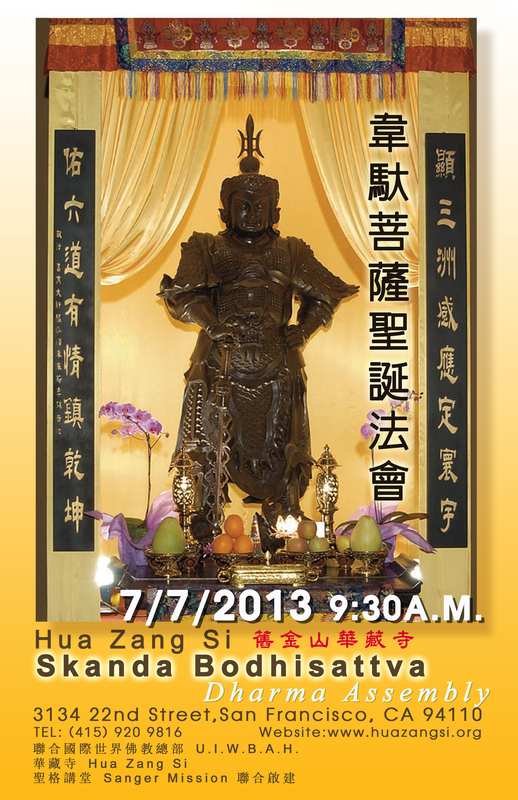 Skanda Bodhisattva often uses his samadhi concentration to stabilize everything contained in the universe. 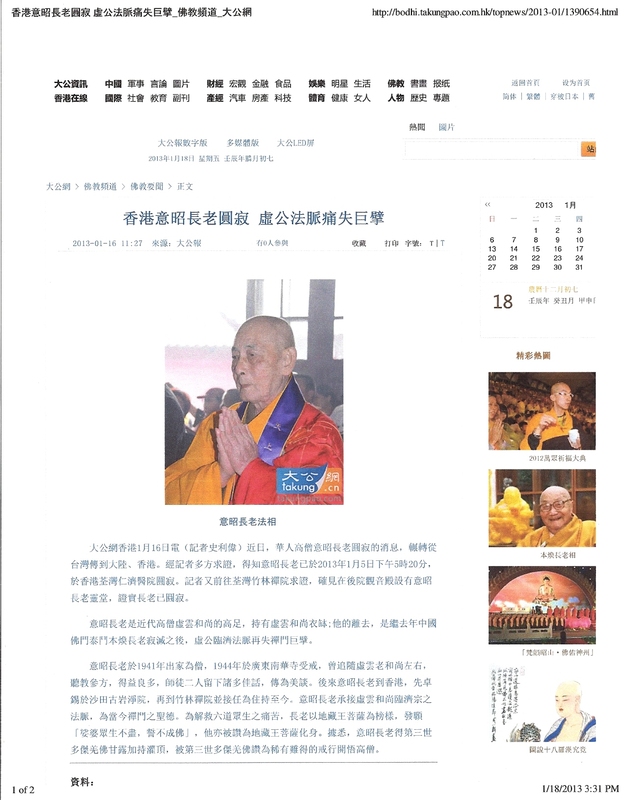 To celebrate the holy birthday of Skanda Bodhisattva, the United International World Buddhism Association Headquarters (U.I.W.B.A.H. 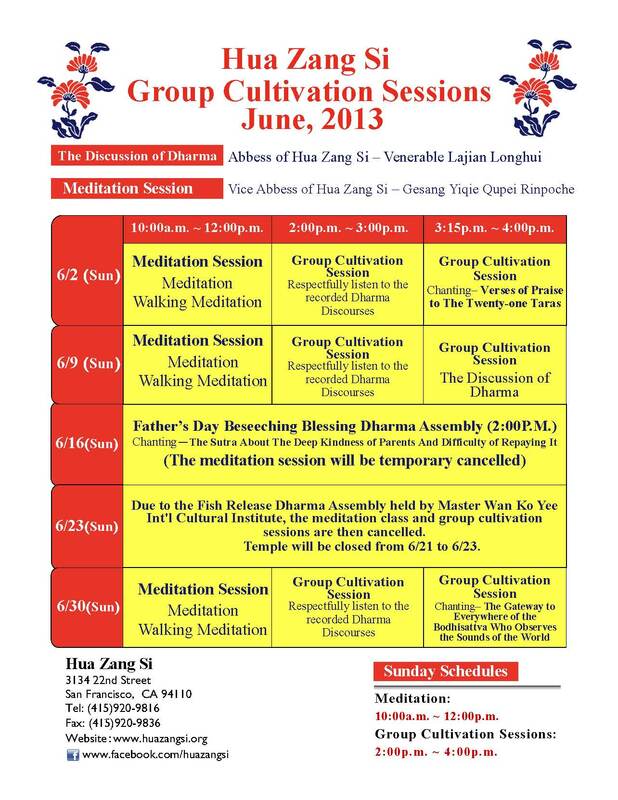 ), Hua Zang Si and Sanger Mission will conduct jointly the Skanda Bodhisattva Dharma Assembly on Sunday, July 7, 2013 at 9:30 a.m. in the Sakyamuni Buddha Hall at Hua Zang Si in San Francisco. 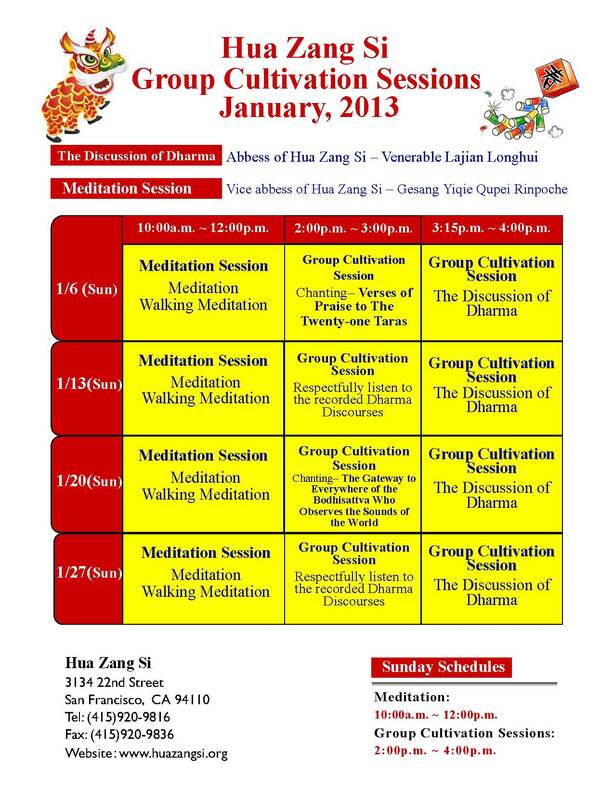 We will recite sutras and practice the ritual of The Meal Offering to the Buddhas. 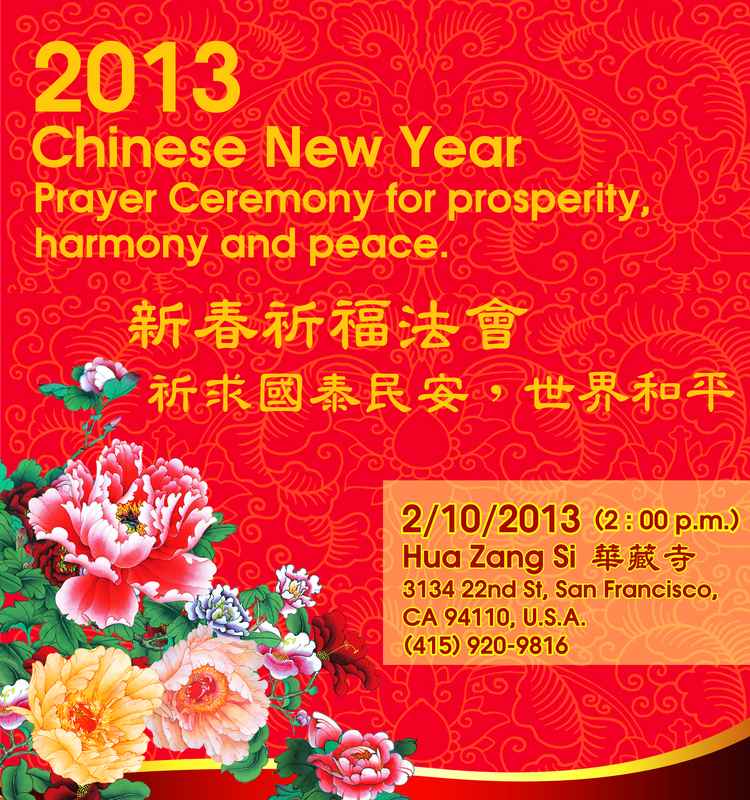 We will pray that the world will be in peace and disasters will be eliminated. 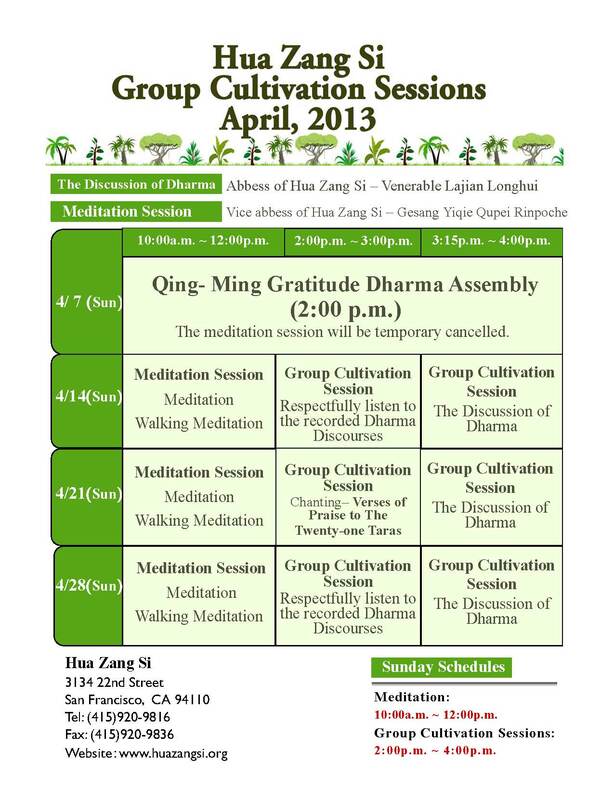 We welcome you to attend the dharma assembly and share the Dharma joy. 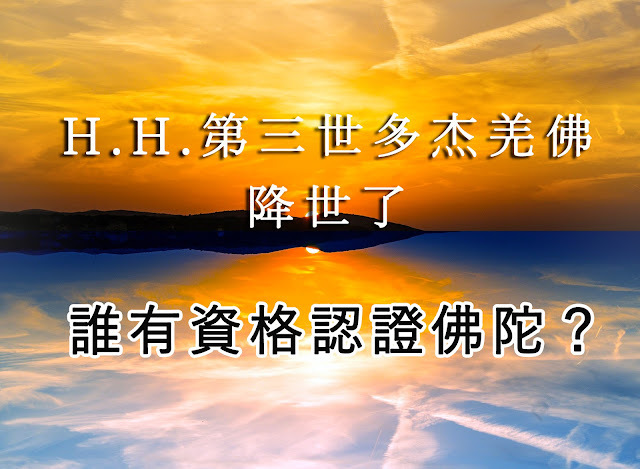 Date 日期: 7/7/2013 (星期日) 9:30A.M. 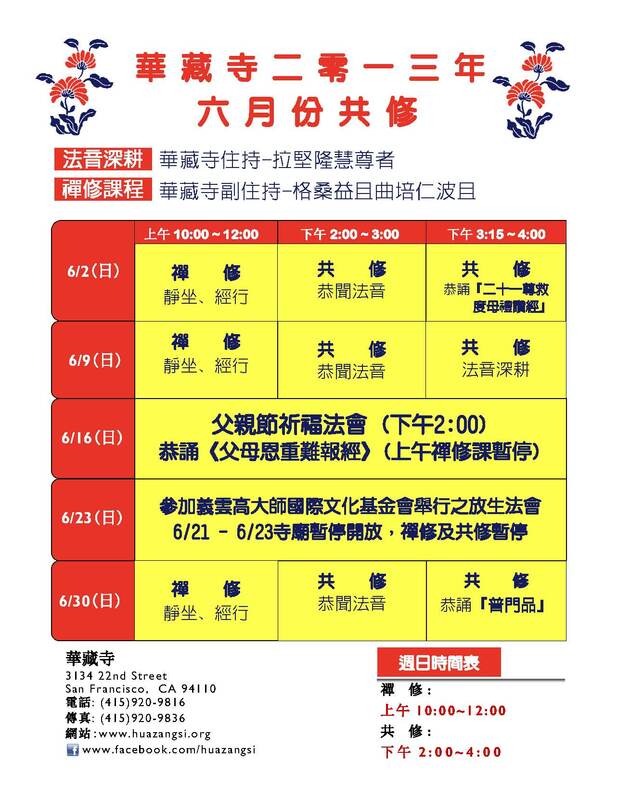 Date 日期: 6/16/2013 (星期日) 2:00P.M. 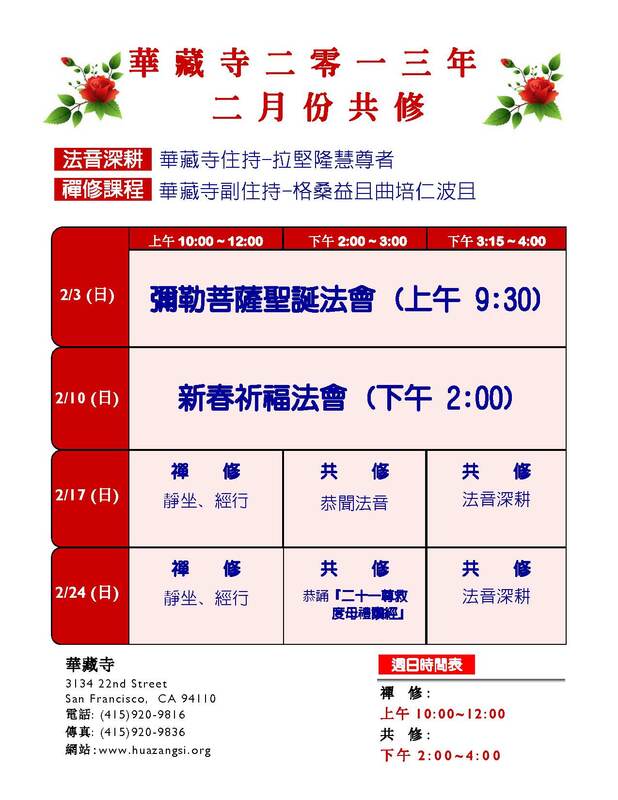 To celebrate the holy birthday of Sakyamuni Buddha, the United International World Buddhism Association Headquarters (U.I.W.B.A.H. 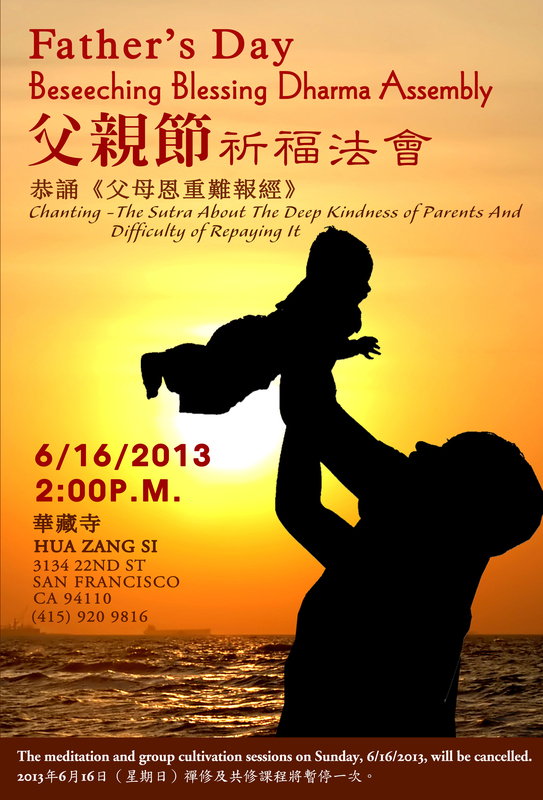 ), Hua Zang Si, and Sanger Mission will hold the Bathing the Buddha Dharma Assembly on Sunday, May 12, 2013 at 9:30 a.m. in the Sakyamuni Buddha Hall at Hua Zang Si in San Francisco. 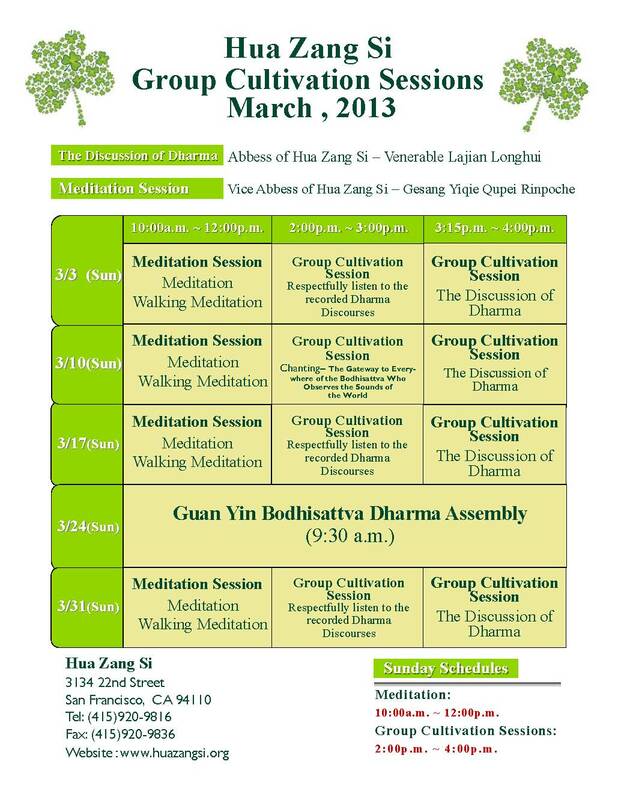 We will bathe the Buddha with the most wonderful fragrant water. 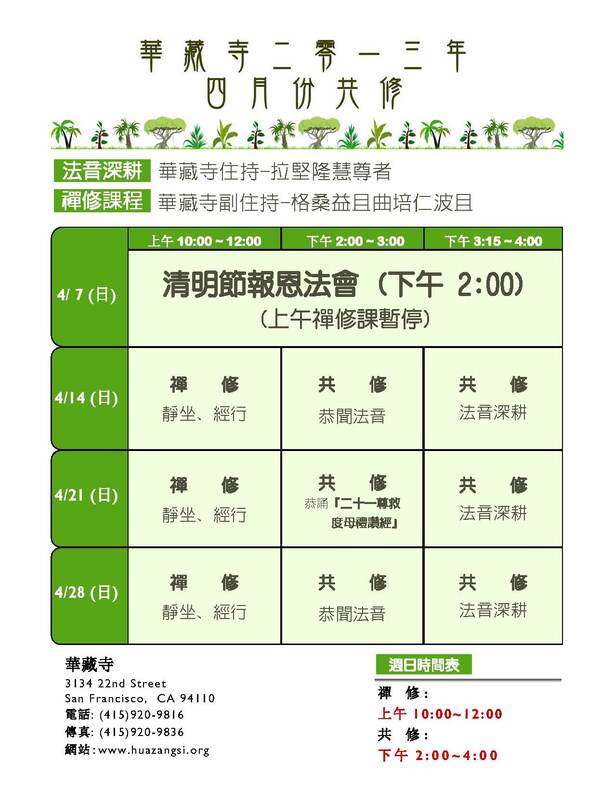 Date 日期: 5/12/2013 (星期日) 9:30A.M. 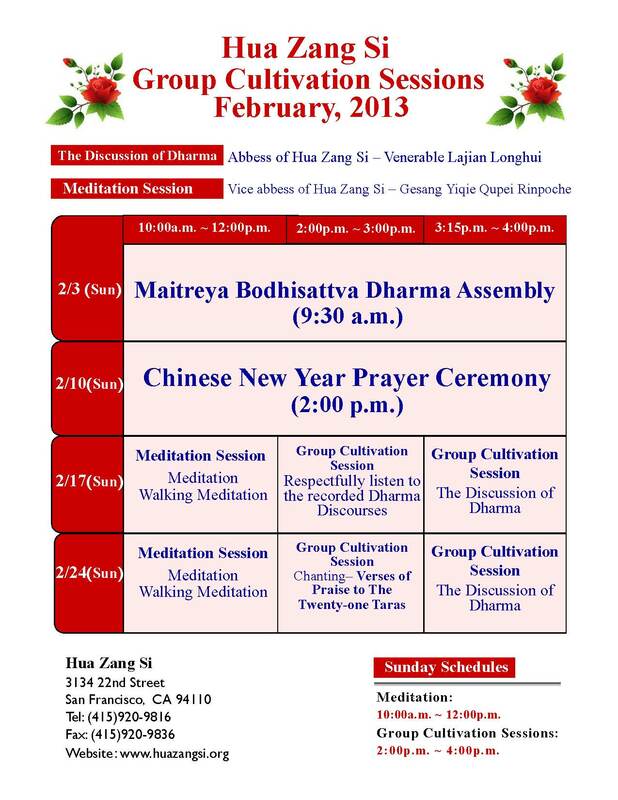 Chinese New Year Prayer Ceremony of 2013 for prosperity, harmony, and peace. 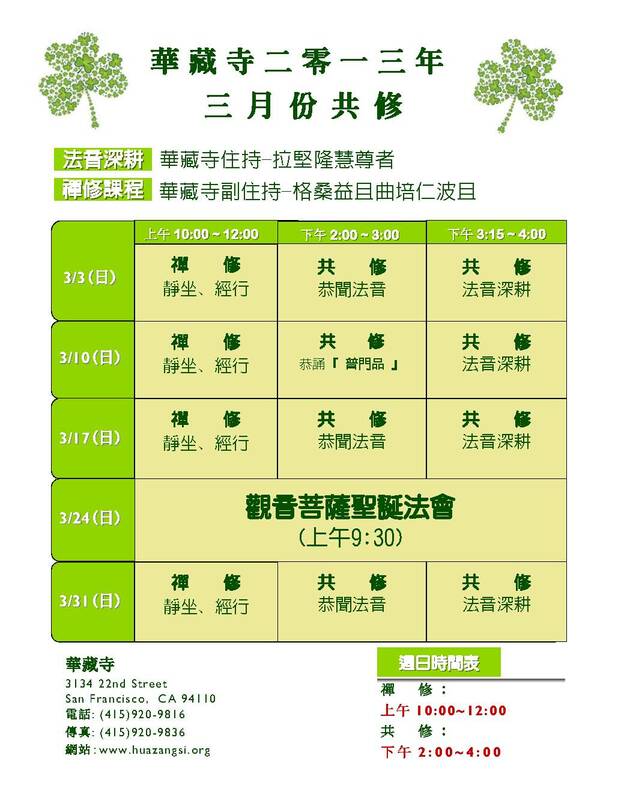 Date 日期： 2/10/2013 （Sunday 星期日） 2:00P.M.